“Where’s The Dial Now?” is a benchmark report that examines the current state of women in the tech & innovation community in Canada. By quantifying the gender disparity that exists in technology today, the report helps to generate awareness and inspire people like you to take action and help drive positive change. 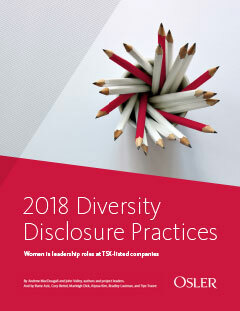 Osler’s Diversity Disclosure Practices 2018 provides an updated snapshot on the participation of women in leadership roles in corporate Canada. Learn about recent developments relating to gender diversity and gain insight into best practices for improving gender diversity among boards and executive teams.